Duncan Coutts was born on the 20th June 1892 to John, a garden overseer, and his wife Euphemia (nee Riddel) at Methlick, Aberdeenshire. 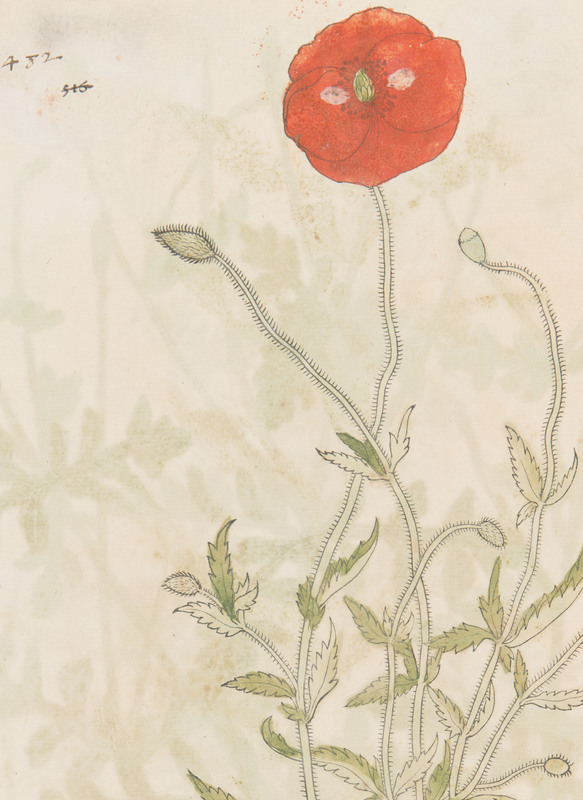 He was a Probationer Forester at RBGE, beginning his employ with us on the 27th November 1912. 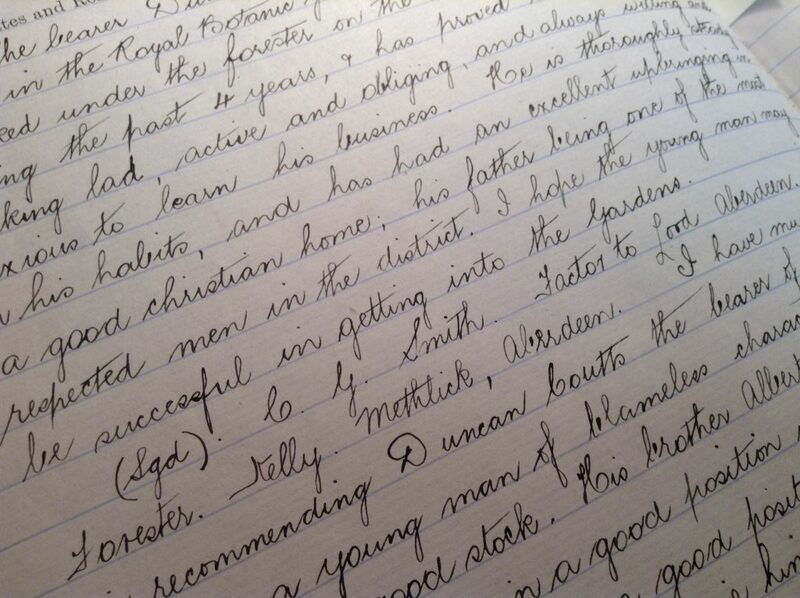 We have his records in our Probationer Registers which provide some background information including letters of recommendation and the subjects he studied with us. There was a third letter of recommendation from the Rev. C. Gordon MacKenzie, Manse of Methlick, Aberdeen dated 14th November 1912, but that hasn’t been transcribed in the ledger. Whilst at RBGE, Duncan would have commenced a three year period of training, working in the Garden during the day, and attending courses and exams in the evening. His marks were excellent, over 70% for the majority of his subjects including bookkeeping, diseases of plants, mensuration and hand surveying, meteorology, physics and chemistry. He had to take part in a demonstration with Professor Isaac Bayley Balfour – he noted that Duncan’s results were good. Strangely, Duncan’s second lowest mark was 56% for Forestry which is a little surprising considering that was where his training and potential future lay. The only other entry on his page in the Probationer Register is a note saying he left the Garden on the 29th August 1914. Destination on leaving: “Enlisted 5th Bn Cameron Hrs… Died of wounds 4th May 1917”. There are many entries in the Register similar to this. Indeed, Duncan was one of the nine men from RBGE who joined the 5th Queen’s Own Cameron Highlanders together on the same day – I wrote about them in an earlier Botanics Story on the Battle of Loos. Duncan’s Regimental number was one digit higher than colleague Lance Corporal William Bennett’s – they were presumably together in the queue. 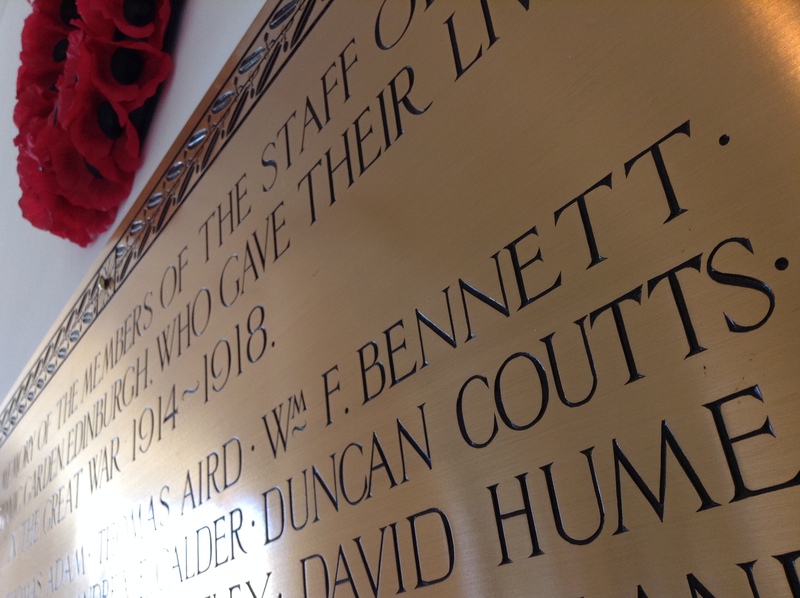 (Bennett was killed on the 25th September 1915 on the first day of the Battle of Loos alongside three more RBGE colleagues) Coutts stated on his army service papers that he had previously served with the Gordon Highlanders for four years before being discharged, but unless this was on a part time basis (like a territorial unit) I find it hard to see how he could have when his RBGE references show he was working as an apprentice forester between the ages of 16 and 20 like his older brother. I wonder if he had concerns that his friends would be accepted for the army and he perhaps wouldn’t – his service papers state that his physical development and pulse rate were poor, and he was given artificial dentures by the army dental surgeon – this doesn’t seem to have been a barrier to his acceptance, but perhaps that didn’t stop him worrying. Either way, Duncan became a Cameron Highlander that day alongside 8 of his co-workers and his training began. He entered France with the Camerons on the 10th May 1915, and was involved in a major offensive not long after at Loos on the 25th September. As said above, he lost four of his colleagues that day and he himself received a gunshot wound from an enemy rifle that broke the radius of his left forearm. This hospitalised him in England between the 2nd October and the 21st January 1916. He appears to have remained at home until his return to France on the 4th December 1916 – it would appear he was with the reserve battalion, the 3rd Cameron Highlanders during this time. If this was the case, he avoided the Battle of the Somme in 1916, but his first major offensive on his return was the Battle of Arras, a far deadlier affair if one looks at the number of casualties per day. The beginning of this offensive has already been described in the obituary of John Hatley. 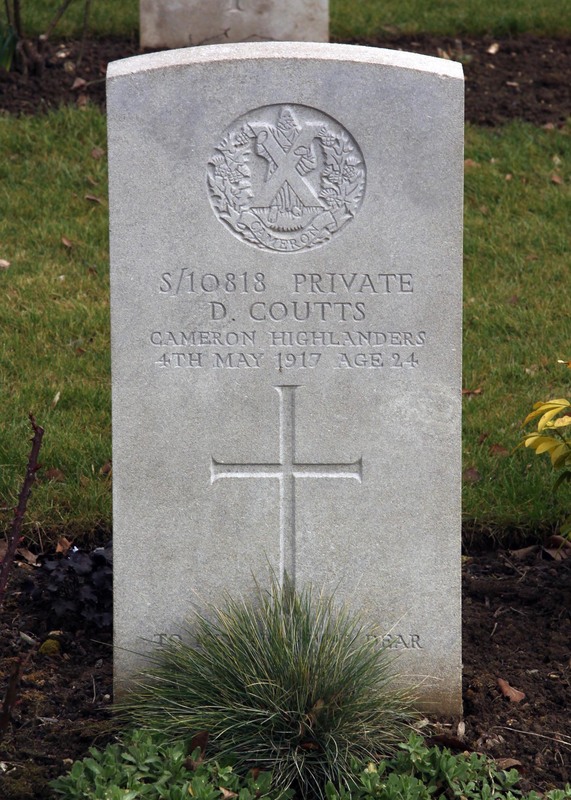 Coutts’s battalion was in the 9th Division, just to the north of Arras and to the south of Hatley’s 34th Division. Coutts’s objective on the first day of the offensive, the 9th April 1917, was I believe to head towards Athies and Fampoux taking enemy trenches as he and his fellow Camerons went. The first two days of the Battle were considered to be very successful with objectives being met and land being taken. Unfortunately, after that, mistakes began to be made, opportunities were missed, communications broke down and the Germans were able to regroup and counter attack. Again, it looked as if the British were doomed to defeat – it was as if they were so unused to having an advantage they didn’t know how to build on it when it happened. Further south the French army was in disarray and approaching mutiny, leaving the British with no choice but to carry on the offensive long after it should have been abandoned. The last great push of the Battle of Arras was planned to be a central thrust along the River Scarpe on the 3rd May 1917. The plans were put together hastily and the generals argued about the timings and tactics – it ended up being a 16 mile long advance on the enemy with some troops only being given one hour advance notice of what was to come. It was doomed to fail from the start. The Third Battle of the Scarpe began in the dark at 3:45am. It seems the troops were given garbled orders, soon became confused (some even ran into a lost tank trundling in the wrong direction) and chaos ensued. It was the usual story of uncut wire and enemy machine guns, but for many survivors, the 3rd May stood out as the worst in their lives. Officially, the dates of the Battle of Arras are given as the 9th April to the 17th May, but technically it ended on the 4th May, when the Third Battle of the Scarpe ended and the British ceased to push forward any more. 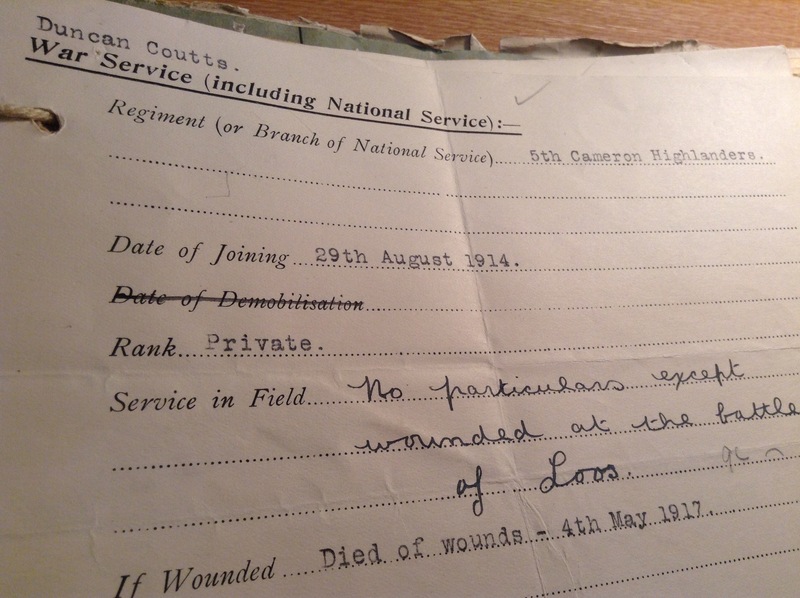 It was on that day that Private Duncan Coutts was wounded. It is unclear what the 5th Cameron Highlanders were doing on the 3rd and 4th May, but they were part of the 9th Division who were attempting to capture Greenland Hill to the north of the Scarpe. Coutts’s records are difficult to read and interpret but it looks as if he was wounded in the abdomen and was picked up by the 27th Field Ambulance. He died later that day from his wounds. He was 24. His medals were sent to his parents along with his personal effects which were listed in his service records: two pocket books, New Testament Bible, Devotional Book, two coins, two identity discs, pipe, 18 photos and some correspondence. 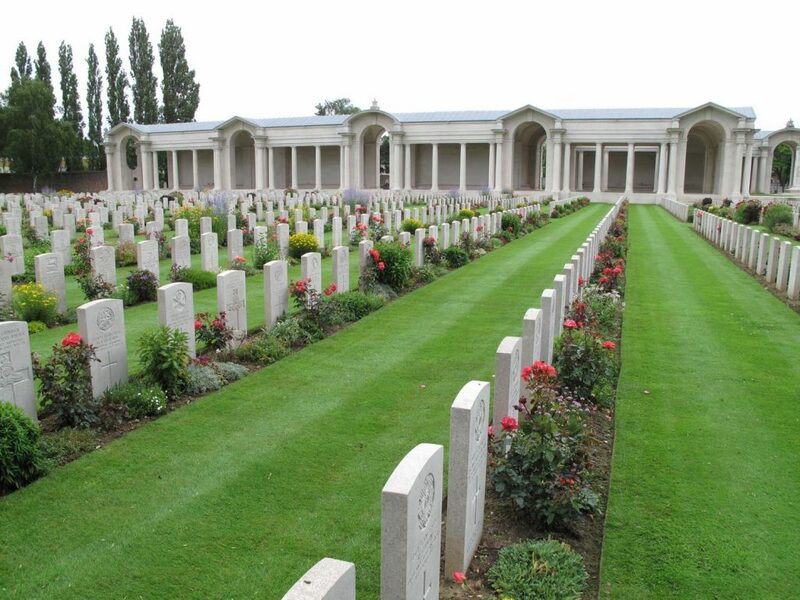 He is buried at Faubourg D’Amiens Cemetery in Arras and is remembered on the RBGE War memorial and on memorials at his home village of Methlick. Thanks are due to Garry Ketchen for allowing me to use his genealogical research, and to Steve Rogers of the War Graves Photographic Project for allowing me to reproduce their photographs. I referred to the excellent “Cheerful Sacrifice: The Battle of Arras 1917” by Jonathan Nicholls and records available on Ancestry.com when writing this post.